The match is planned as a final farewell for the Form 3 students who studied under the LEARN&play program at both schools. 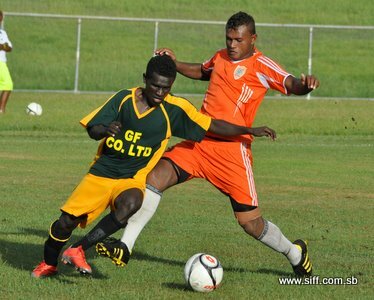 The Solomon Islands Football Federation (SIFF) special projects office is organising the match in collaboration with authorities of Aligegeo Secondary School and King George the Sixth Secondary School. SIFF special projects manager, Phillip Ohoto’ona, says that the intention of the match is for the students of the LEARN&play program to interact but it will also serve as a measure of the strength of the program in each school. “The idea is based on giving the students of Aligegeo and King George the opportunity to come together for one final time and share in the game that has been central to their lives in the past 3 years. They can display their abilities and skills to the public after going through this unique football education program,” Ohoto’ona says. Ohoto’ona adds that the match is also an opportune time for selectors of clubs and also from SIFF to assess the players and probably pick some of them for their elite programs. “Some of the players who will be playing are among the best in Solomon Islands and I encourage local clubs especially to turn up to witness the match. You may be able to pick some new talent for your clubs from this match,” Ohoto’ona highlights. The students that will be playing have been studying under the LEARN&play program which has brought them through the 3 years of junior secondary education. Besides the formal education they received the students also underwent football training provided by LEARN&play and run by coaching instructors. The effectiveness of the training has already seen success at the international level with the LEARN&play U16 winning the TVL tournament in Vanuatu in 2009. A good number of students from the program represented Solomon Islands in the Oceania Football Confederation (OFC) U17 tournament earlier this year. Solomon Islands finished third in that competition. Some of the LEARN&play students are already playing for clubs in the national soccer league, most prominent of which are Harrison Mala, Fred Bala and Israel Fanai Koti who recently signed up for Koloale for their O-league team. The match will kickoff at 3:00pm and entrance to Lawson Tama is free.